This is a big post. Big as in: Holy Baloney Batman, we're getting close to the end! Goat Island Skiff, activate! After priming my boat, I had to leave for work. I got home 5 days later, gave it a good smoothing sand job, and then cleaned up the dust with the shop-vac blower to vacuum to rag soaked in denatured alcohol. 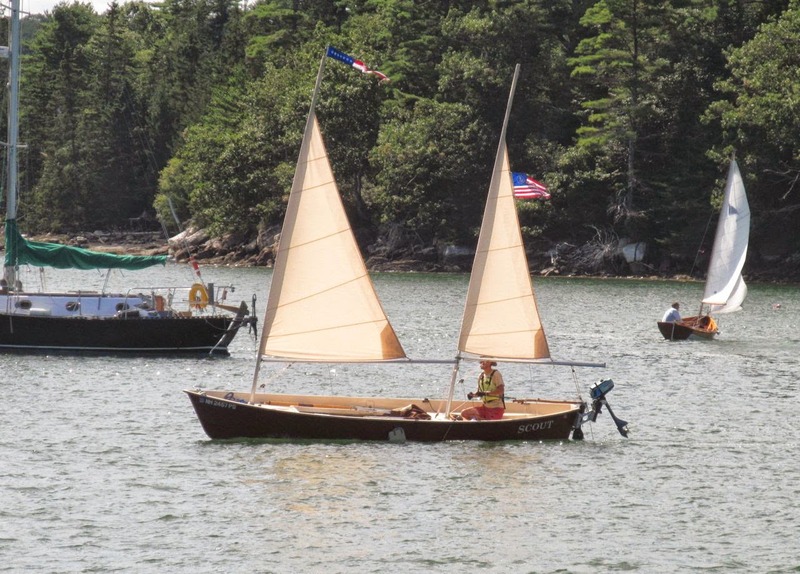 The denatured alcohol was a tip mentioned on the Wooden Boat Forum-- it will help soak up and evaporate any water that had absorbed into the primer as well as clean up dust. After that, it was time for painting. The paint was Interlux Brightside, a one part marine paint. It's expensive, about 40 bucks or so a quart depending on where you purchase it. I decided to use the pricey stuff as opposed to Behr Porch Paint or Rustoleum Enamel because I figured I've spent so much money on this boat already, I might as well use good paint on the exterior as well. It's just a bit more anyway, and it was well worth it, as you will see. Not bad! Check out the reflection of the towel! It looks like gel-coat! I am the painting man, thanks to Interlux Brightside and it's easy-to-apply-million-dollar-finish qualities! Next up, the interior, and sailing. For the super vigilant, they will notice I still do not have rudder hardware on the stern. This is bad news, and there will be a post devoted to rudder hardware, Duckworks (awesome), and West Marine (awful evil disgusting chain store I will never frequent again). Let me just say this, if my boat gets finished and I don't have rudder hardward and this impedes me from sailing, I am going to freak out. You cannot underestimate the value of good paint can you? I don't care what people say about yacht paints being too expensive and not worth the money. Yacht paints are different, and they are formulated to work very well, and that is why they are worth the extra money and why house paint doesn't cut the mustard. You've just proved that, because your boat is looking truly awesome!